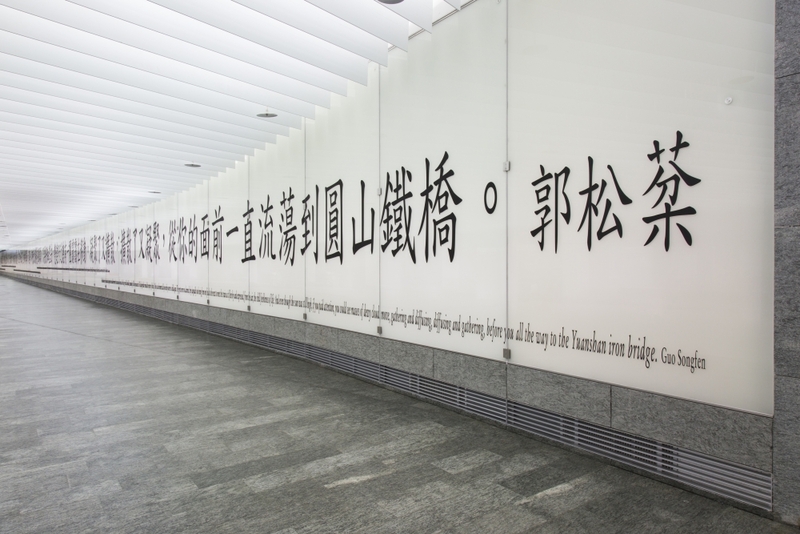 ‘One Field to the Next’, 2013 is a public artwork by internationally acclaimed conceptual artist Joseph Kosuth, commissioned for the new Taipei Main Station MRT Taoyuan International Airport Line. It is the first public work Kosuth has made in Taiwan. Inspiration came from a paragraph in the short story Running Mother written by famous Taiwanese author Guo Songfen. A poetic and allusive story dealing with memories of Taiwan’s past, Kosuth selected and represented one section of the text in its original Chinese, constituting the core of the artwork’s physical form and content. Translations were then made into ten global languages, including Japanese, English and French, and arranged around the Chinese to complete the installation. The design of the work actively resonates with the flow of movement and traffic at the station. Conceptually, it seeks to stress the connection between the work and its surrounding architectural and social environment. For more information, please visit mocataipei.org.